“Drama house” is a house when the simple ring at the doorbell can have unpredictable consequences; event, one is stranger then another and in the same time all, what happens with habitants belongs to everyday life. Sometimes these circumstances are a little bit exaggerated. Spectator stands in front of low fence with a door-gate. There are 8 doorbells on it. The act of ringing provokes an action in an apartment window. Based on chance and the choices that viewers make, the project explores the contemporary trends in the construction of a narrative and the interplay between diverse informative sub-layers effected through the impact of digital, non-linear media. It also questions the very process of story telling and at the same time considers the way of audience reading. It investigates the differences of individual and collective perception. In other words, the sequence and choices that each viewer selects reflect his own perspectives and behavioral patterns, thus makes the viewer much more than an active participant. 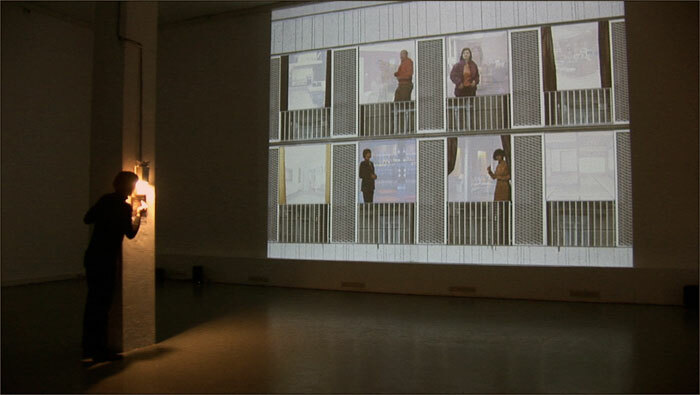 By interacting with the installation the viewer is engaged in the creative process: re-telling the ever-changing story through the utilization of the primary capability of the digitization: reshaping the information. Therefore, each participant walks away with a unique, slightly different vision, each shaped according to his own choices and directions. Interactive media and the digital environment of the DH and its narrative function through a recognizable metaphor that makes access to the information meaningful: a house as a conceptual society model and an apartment as a private space. This reference transforms the objects and stories in the project into the metaphors and reminds us of the art cultural function: as a site of memory of the social collective imagination and as a site of representation and power. Alexandra Dementieva is a multi-media artist based in Brussels. Her main interest is application of social psychology and perception in multimedia interactive installations. She creates installations in which numerous cultural forms of expression, such as dance, music, film, environments and performance are being given a meaningful place. She links the “open” work of art to the freedom of the spectator to assemble his or her own images. In her work there is no trace of one way traffic – not from the art work to the spectator, nor in making the art work as the frozen form of one or the other hunch or reflection. Her video work integrates different elements, including behavioral psychology and developing narrative through a point of view of subjective camera.